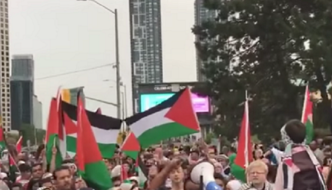 B’nai Brith Canada is calling on the City of Mississauga to enforce its bylaws against protestors who have threatened violence against Jews and encouraged children to engage in terrorism. Then again earlier this month, Muslim speakers made similar calls to violence at the same location, and with children present. Shouts rang out to destroy Israel and for the blood of martyrdom. Recently, Palestinian Media Watch discovered that Palestinian children were stabbing Israelis and committing other terror attacks to enhance their status in society. It meant so much to these children to harm Israelis in so-called “resistance” that many of them also lied to authorities or their peers about being guilty of attacking Israelis, to heightened their social status. Clearly, these children are being conditioned by jihadist adults; now the same conditioning is happening in the Peel region in Canada.